On several occasions I have alluded to where I live as the “Bishop Compound”. 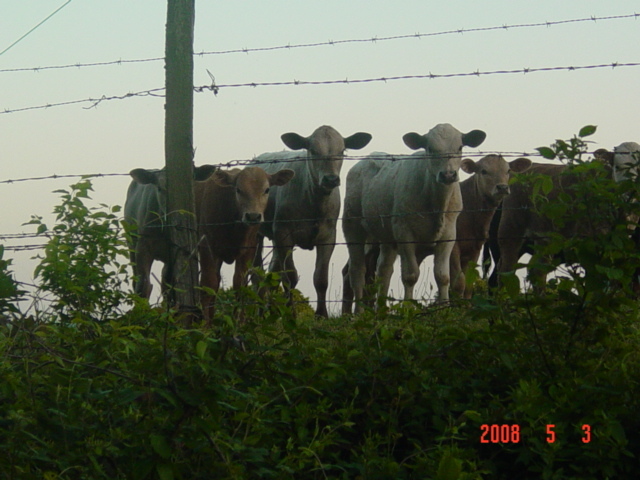 If you are wondering what these cows are looking at… they are watching me work in the yard. I guess they find me amusing. Living out here in the “country” has a lot that is extremely appealing. It’s finally Friday and I look forward to tomorrow morning out on the front porch. I will be looking at the corn field and hopefully a few deer, rabbits, and squirrels. Well, this evening was not as pleasant. It’s hot! It’s dry and we need rain!! I thoroughly enjoy driving my Jeep Grand Cherokee. But today – I wish I had a Ford F-150 4X4 full cab truck! Where I live I don’t have garbage pick up. That means I have to go to the dump. And today it was in my Jeep. I haven’t been to the dump in a long time. The trash that’s actually in the garbage can has been there for a long time. WAY TOO LONG!!! I put my two cans in the back of the Jeep and down the road I went with the most horrible smell on the planet. Did I mention that half of my windows do not roll down and the Air-Conditioner doesn’t work? I made it back home without puking. I went to clean out the cans. I removed the tops and the smell that was in there was so bad… you guessed it – let the puking begin! How did a city boy end up on a farm? Breath deep and be thankful.